Feels like spring doesn’t it? Seems appropriate since we’re heading into the 2nd week of March, but that sunshine and afternoon temps near 60 sure felt nice didn’t it? Before looking forward, let’s look back at this winter we just “endured”. That’s a bit dramatic, since the only thing we had to endure was some slippery driving Christmas Eve/Day and again the last week of February. What an easy winter west of the Cascades! Meteorological winter has now ended and we are in spring…the 3 months between winter and summer. Calendar makers prefer the late March to late June definition, although that doesn’t follow the sun’s movement or weather very well. Take a look at temps…a slightly cool December, a “crazy warm” January, then a cool February. February of course is interesting because the first week or so was very warm, then the next three weeks were cool. 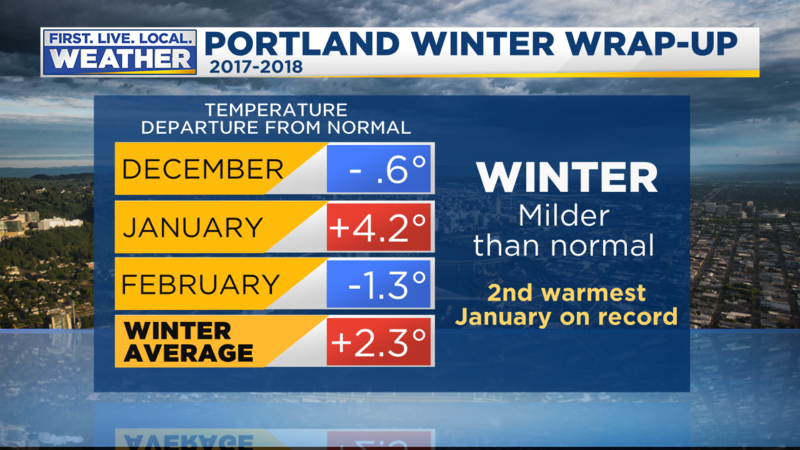 Overall it was a “warm” winter. 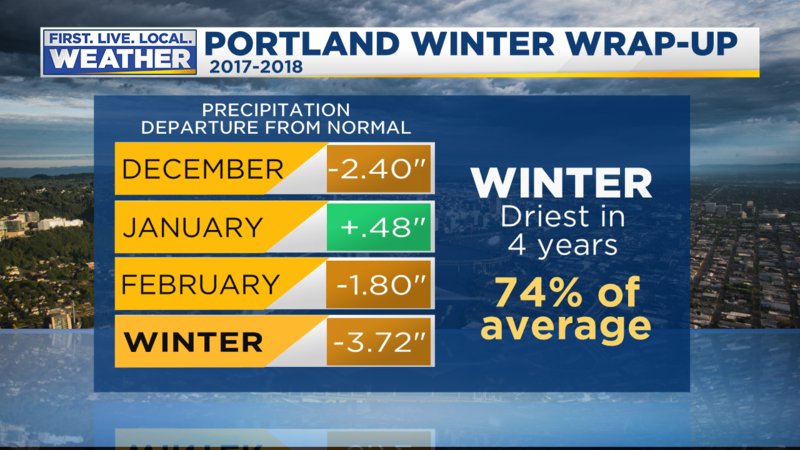 December was well below normal and in February we only saw half of our typical precipitation. January was just slightly wet. Well below normal in Oregon (even with a snowy 2nd half of February). You can’t make up a whole season of low snowfall in just a couple or three weeks. 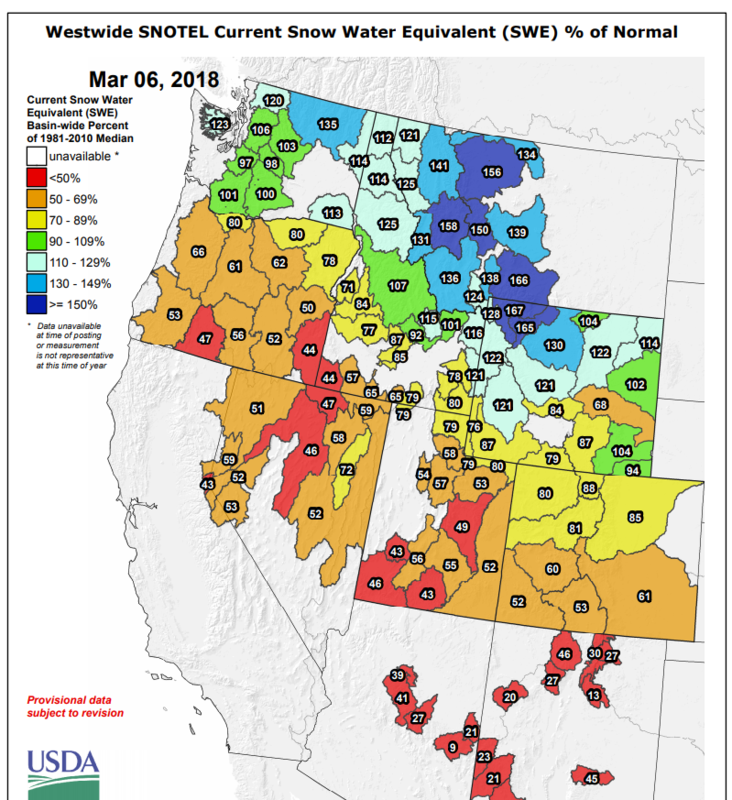 But check out those numbers in Eastern Washington, north Idaho, & Montana…big snow there! 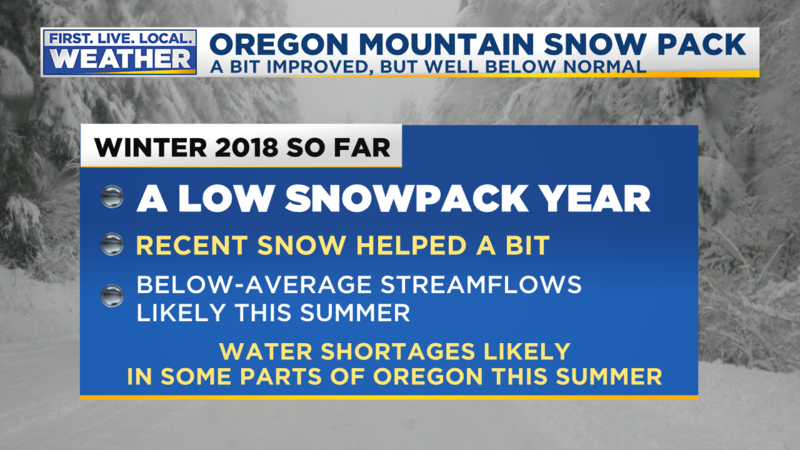 This means the Columbia River will have plenty of water this summer, even though most streams in Oregon will be running lower than normal. Of course if we suddenly turn wetter through May, things could change. Looking ahead, we’ve got a classic spring mix of wet days and some sunshine and warm temps too. 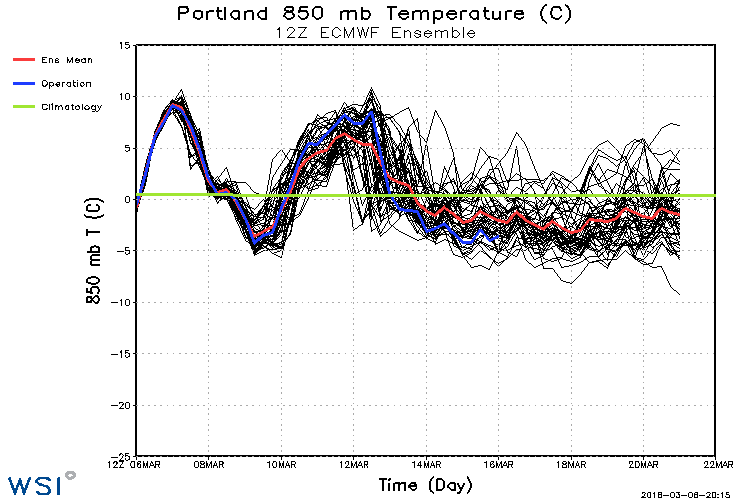 Take a look at the ECMWF 850mb ensemble temperature for the next 15 days. You can see the above average temps right now, then another warm period Saturday through Monday. Then it’s pretty obvious we’ll be entering a cool/wet period by the middle of next week. There seems to be pretty good agreement with the general pattern, although some disagreement on how quickly a cool trough moves inland early next week. It appears to me this means we have some nice spring weather coming up again tomorrow, plus this coming weekend. The ECMWF ensembles show the warmest weather so far this season for Sunday/Monday; highs into the lower 60s. These numbers are likely underdone, at this point something around 65 or so seems reasonable with offshore flow Sunday/Monday. You can also see the period of cool/wet weather Tuesday and beyond next week. 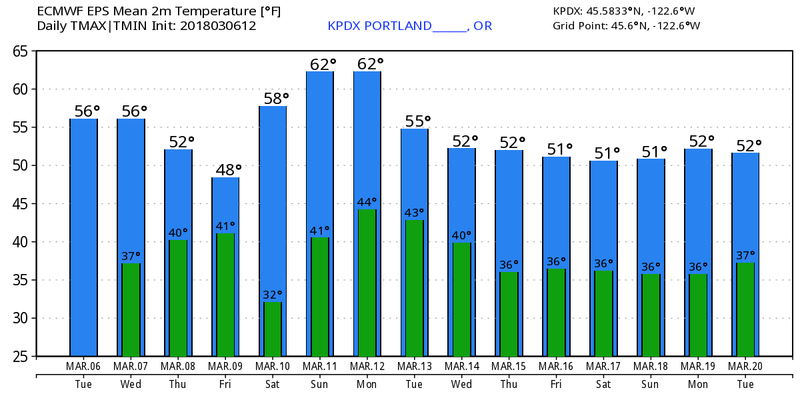 So enjoy some mild weather for the next 6 days, classic cool/wet March weather will return! This entry was posted on Tuesday, March 6th, 2018 at 5:48 pm and is filed under Weather. You can follow any responses to this entry through the RSS 2.0 feed. Both comments and pings are currently closed. Wind Advisory just issued for Portland metro. Wind gusts up to 45 mph. Watching Andy again this morning with puzzled amusement, wondering who picks out his outfits, looks as if he hasn’t changed his wardrobe since middle school…..you know I think the same is true for “strange Tony” too. Post your fashion comments elsewhere – I’m sure the world of TV met couture is anxiously awaiting the wisdom of the Yves St. Laurent of Barton. Crazy but there’s a awesome rainbow in Tigard right now at 6;40 in the morning. I still have a patch of snow in my backyard. Until that disappears, it’s not yet spring for me! Actually(and seriously) it shouldn’t take long for that to happen: By Monday, we’re supposed to see an afternoon temperature near 60F here. Mark, have you turned on the water to your outside coop? Are freezing nights over? Yes, Yes to answer your questions. I beg to differ on the calendar not following the sun. The Gregorian calendar has spring starting on March 20th the Spring Equinox where the sun angle is directly over the Equator. In Summer and winter the parallel of latitude 23°26ʹ north tropic of Cancer or south tropic of Capricorn of the equator.Each of two corresponding circles on the celestial sphere where the sun appears to turn after reaching its greatest declination, marking the northern and southern limits of the ecliptic. It was there. Pay attention. The only good weather, IMO, is cold wet Fall, Winter weather. I’m glad y’all enjoy dry, warm, hot weather. I do not. I am looking forward to cooler, wetter fall weather in fall 2018, Guten tag. We endured being ripped off again this winter, right? I have never had to mow my grass in the first week of February before. I enjoy the lack of yard work in the winter, and the time I get to ignore the yard keeps getting shorter. Winter is nowhere near over in the mountains thankfully. There is still some time to rebound, but of course it usually starts to decline after the beginning of April. I’m hoping to go sledding Saturday afternoon. Should be great conditions but I’ll need sunglasses!